It is Speedy Tuesday on this first Christmas day! This week, we have something rare. 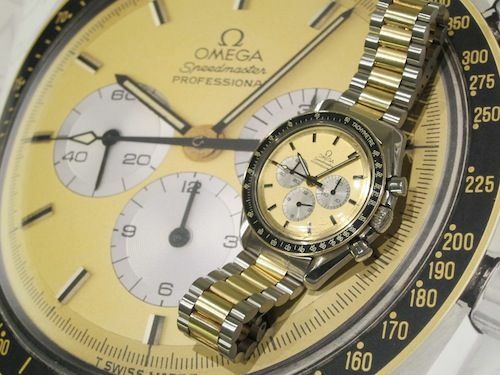 A gold / steel combination Speedmaster Professional that dates back to 1981. A gold colored dial with gray sub dials and black hands. 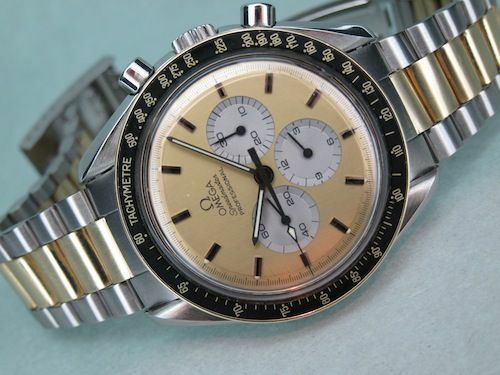 This Speedmaster Professional goes by the reference of DD145.0022. The bezel of the Speedmaster DD145.0022 is also made out of gold and the black aluminum inlay features gold printing. The bracelet is more familiar, it is a ref.1171 bracelet with 633 end-links. This surprised me as well, as I only knew this combination in stainless steel. Apparently, Omega just used the same machinery to assemble this gold / steel bracelet as they used for their 1171 bracelets. The end-links are incorrect on this watch though, as they should have a gold center as well. The owner ordered the right pair of end links from Omega last week, we are curious if they are able to deliver them. Not pictures here, but the case back of this Speedmaster Pro DD145.0022 the ‘regular’ Speedmaster Pro model with the ‘First Watch Worn On The Moon’ engraving. We’ve rarely come across these gold / steel models with this particular dial and bracelet. It is not a limited edition or neither does it have an number engraved on the case. We guess it was ‘normal’ production back in 1981. However, they seem to be rare, especially with the original bracelet. 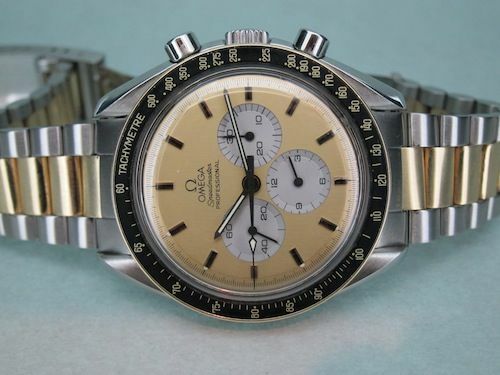 Like all hand wound Speedmaster Professional watches from that time, this Speedy Pro DD145.0022 one also had the famous Lemania based caliber 861 movement. The crystal is plexi (Hesalite). If you have any more information regarding this gold / steel Speedmaster Professional, we would be more than happy to learn! Thanks to Michael from Watch-Site for the watch (it isn’t for sale)!